Charity rides like the Ride To Conquer Cancer and the MS 150 have been going on, in one form or another, across Canada for decades and continue to offer an accessible way for very casual cyclists to try a light version of bicycle touring and experience the enjoyment of cycling for longer distances. I'll never forget my first charity ride - known at the time as the Bike-A-Thon in Toronto. I would collect pledges from my paper route customers (pennies per km) and was always very proud of the (meager) amounts of money I was able to raise. The loop was 35kms and I was 14 the first year I did it. I'll never forget how empowered I felt after riding that distance on my own. The next year I decided to do an extra loop to try and raise more money - much to the chagrin of the people who pledged to my ride - they suddenly had to pay twice what they expected! 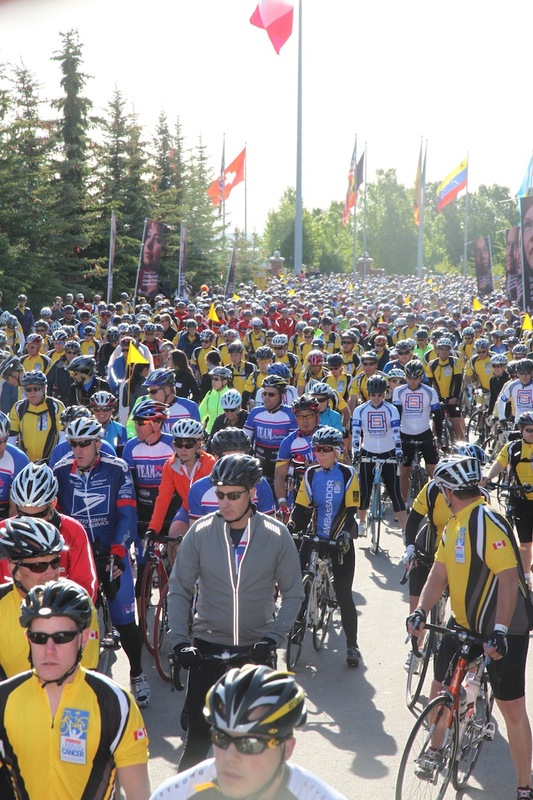 These rides have been bringing new cyclists to the sport with many needing to purchase a new bicycle for the event. There are many different possibilities out there - road racing bikes, cyclocross bikes, flat bar hybrids, touring bikes - for the average new bike rider the choices can be very confusing. 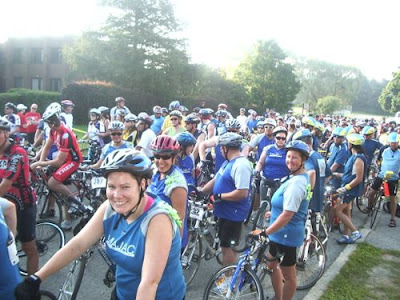 From our point of view the most important things to consider is making sure you get a bike that you'll be happy using once you've completed the charity ride and is very comfortable to ride. 1. Touring bikes tend to have much higher handlebars relative to the height of the saddle - meaning, you can sit up taller on a touring bike offering all day comfort. 2. The wheelbase of a touring bike is longer than a racing bike allowing for use of wide tires and fenders, but most importantly, a long wheel base can help the bike have a more stable manner, especially when loaded with panniers/gear/work stuff/groceries. 3. Touring bikes place an emphasis on durability, serviceability, and flexibility over lightweight, stiffness, and performance found on road bikes used in racing. So, lets break it down a little further. Point #1 is all about comfort. If you are uncomfortable on your bike you will not efficiently use your energy during the ride and end up tiring much more quickly - no matter how light/fast/expensive your bike is. Overly aggressive positioning found on "racing" road bikes can also lead to injuries, comfort should be priority one when looking at a new bike. For a few more thoughts on comfort read this older article by someone who knows all about making comfortable bikes. Point #2 relates directly to finding a bike that easy to ride. Touring bikes have longer wheelbases (distance between the centre of the wheels) which translates into a few important details - very stable riding manner making it easy to cycle over longer distances, more stability on rough roads and strong crosswinds and more room for full fenders and fatter (read, more comfortable) tires. Fenders will keep you cleaner and drier in case of wet weather. Fat tires are less prone to punctures and pinch flats. Point #3 focuses on after you have completed the charity ride. What are you going to do with this fancy new bike you bought? Well, hopefully you'll keep riding it! Touring bikes are fantastic commuting bikes, great for hauling groceries, and of course, super fun to ride on the weekend. So, there you have it. If you are planning on purchasing a new ride for this summer charity ride season do yourself a favour and test ride a touring bike - you might be surprised how fun they are to ride. Health and Fitness: Postural Corrections? Move! !